MAGNA Prima Bhd (MPB) expects to record a gross profit of A$50.3 million (RM162.81 million) from its project in Australia. 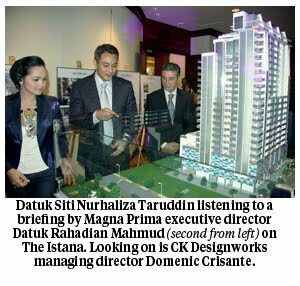 With a gross development value (GDV) of A$210 million (RM679.24 million), the project, named The Istana, is set to be completed in 2014. The Istana is a 25-storey single- tower residential apartment situated on A'Beckett Street in Melbourne, with more than 27,000 sq ft space and 320 units comprising studio units; two-, three-, and four- bedroom apartments; and double- storey penthouses. The project has garnered 62 per cent take-up from Australians and international buyers. Magna Prima executive director Datuk Rahadian Mahmud said Australia is among the popular countries for property investment, due to its stable real estate market which offers good investment returns. Indeed, he said, Australia's expected 3.25 per cent gross domestic product growth per year, positive employment growth rate, contained inflation and property price increases of about 3.0 per cent this year, support the company's investment decision. "We immediately recognised that it would be financially lucrative for the company and our investors," he said at the launch of The Istana by popular local singer Datuk Siti Nurhaliza Tarudin here yesterday. While MPB has set in motion its vision for regional development, the company will not deviate from its primary focus on local property development projects. "Our regional plans will run in tandem with our local projects. The local property scene remains our mainstay, especially with the impending escalation in housing and commercial projects. "We will continue to identify suitable landbank that we can acquire which will offer us niche pocket-size developments with high GDV (gross development value)," said Rahadian. Currently, MPB's landbank totals 28.35ha, mostly located in the Klang Valley. Among the company's latest projects are the Boulevard Business Park, which will be launched by first half of this year, and the Habitat d'16 in Shah Alam, to be launched in second half of this year. MPB is also in the midst of exploring options for a signature development of a two-tower residential and commercial project in Jalan Ampang with a GDV of around RM1.3 billion, planned to be launched within two years.